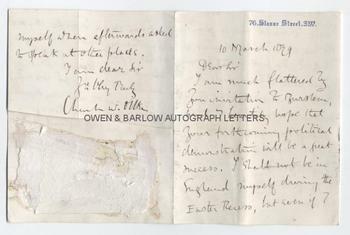 SIR CHARLES DILKE Autograph Letter Signed. British (English) Liberal politician. His career was ruined by the 'Crawford Scandal'. ALS. 4pp. 76 Sloan Street, W. 10th March 1879. To an unnamed correspondent [William Woodall]. 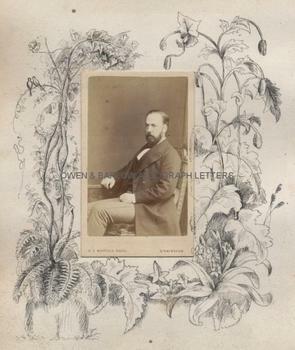 Together with a contemporary 19th century carte de visite portrait photograph of Charles Dilke. 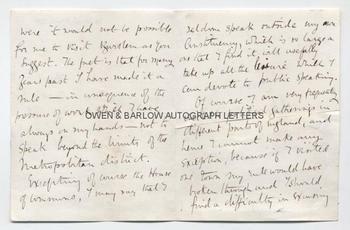 "I am much flattered by your invitation to Burslem, and I heartily hope that your forthcoming political demonstration will be a great success. I shall not be in England myself during the Easter Recess, but even if I were it would not be possible for me to visit Burslem as you suggest. The fact is that for many years past I have made it a rule - in consequence of the pressure of work which I have always on my hands - not to speak beyond the limits of the Metropolitan district. Excepting, of course, the House of Commons, I may say that I seldom speak outside my own Constituency, which is so large a one that I find it will usefully take up all the leisure which I can devote to public speaking. Of course I am very frequently invited to political gatherings in different parts of England, and here I cannot make any exception, because if I visited one town my rule would have broken through and I would find a difficulty in excusing myself when afterwards asked to speak at other places." 12mo. Approx 4.5 x 3.5 inches. Mounting residue to lower half of last leaf and with that leaf cut to allow the top to be turned over for display in an album, else in very good, clean condition. 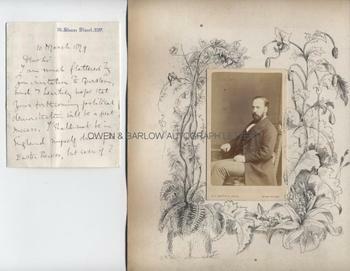 The portrait of Charles Dilke is a 19th century albumen carte de visite photograph by H.J. Whitlock of Birmingham. It is mounted on photographer's original mount and laid down on an album leaf with a border of fine original penwork decoration. It shows Charles Dilke half-length, seated in profile and turning to his left. It measures approx 3.5 x 2.25 (excluding mounts) and is in fine condition. Charles Dilke was the radical, reforming M.P. for Chelsea, a seat he held from 1868 to 1885. He supported the municipal franchise for women, the legalisation of Trade Unions and improvements in working hours and conditions. In 1880 Charles Dilke was to become under-secretary of State for Foreign Affairs under Gladstone and, in 1882, he entered the Cabinet as President of the Local Government Board. He was tipped for high political office and talked of as a future Prime Minister but his career was cut short when he was involved in the notorious Crawford divorce scandal, from which his public reputation never recovered. Although he does not name his correspondent in this letter, it is to the radical Liberal, William Woodall, M.P. for Stoke-on-Trent and Hanley and a Trustee of the Wedgewood Institute. From a 19th century collection made by William Woodall.